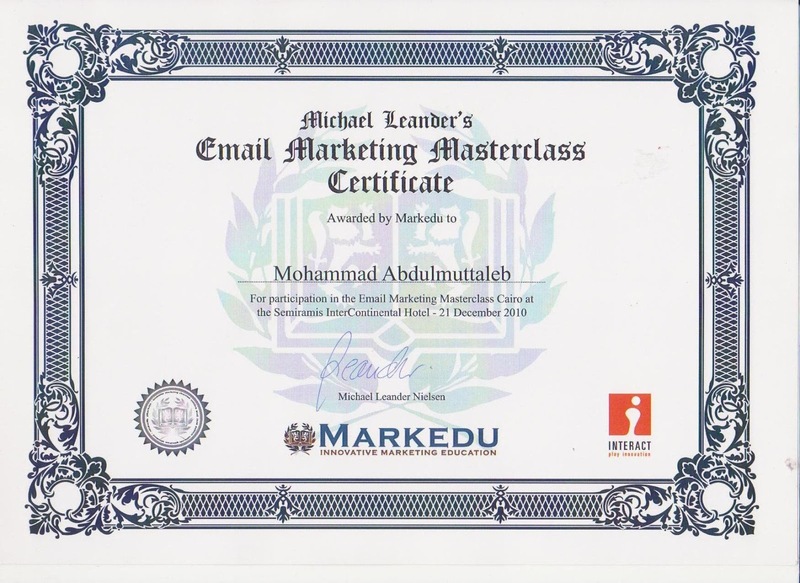 I always believe that digital publishing has an amazing growth opportunities here in Egypt and MENA region. We all read daily newspapers whether the printed edition or the web-based versions. At top of our interests is the daily/weekly published columns and op-eds for famous authors. The challenging question is: Why I am unable to subscribe online to receive my favorite articles directly to my email inbox? The question all the world is asking nowadays: why the Egyptian president Mohamed Hosni Mubarak - who was described as proud man by ABC's Christiane Amanpour - why his 30 years of governing the country were resulted in protests in Tahrir Square asking him to leave? Mubarak has been described by Facebook page of We All Khaled Saed in 15th of January 2011 as leader who had been "serving the nation for 30 years". Every one of us has role that will end one day whether by death, succession (i.e. end of term), promotion, resignation, or even lay-off. CEO is no exception for that. Egypt has vast majority of Muslims who believe in one God and in death as fact. Although the toppled president Hosni Mubarak was Muslim, it seems that he did not realize the importance of having clear and solid succession plan in country like Egypt (85m+ population, army of 1m+ soldiers, etc). 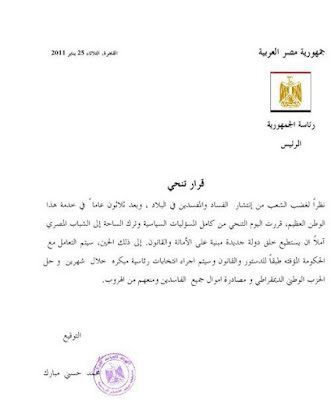 Mubarak didn't assign deputy or vice-president unlike late presidents Naguib, Nasser and Sadat who always assigned at least one vice-president (Mubarak himself was VP for Sadat). In today's dynamic environment, one-man show is no more accepted whether for large corporation or leading country. Achievements of ex-leaders and previous managers should be communicated among the entire organization, so it would be the 'normal' situation that CEO and any other person will deliver the responsibility to someone else after him at certain moment. 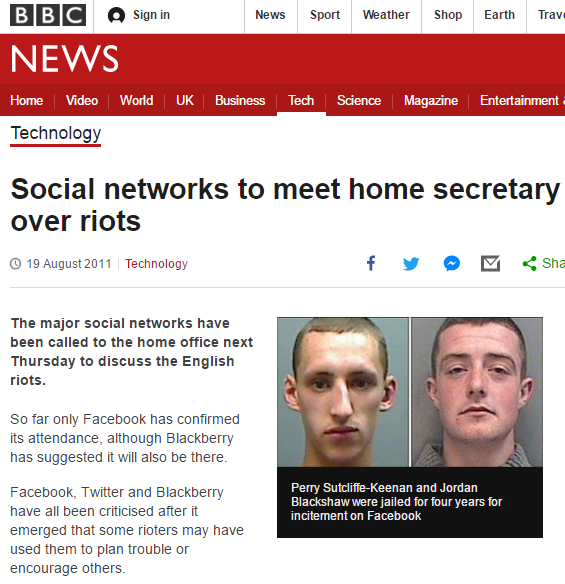 BBC unveiled major social networks were called to the home office next on 25th of August to discuss the English riots with home secretary Theresa May. Facebook has confirmed its attendance while Twitter did not respond to a question by BBC. Blackberry has suggested it will also be there. Prime Minister David Cameron has said the government would look at limiting access to such services during any future disorder. "We look forward to meeting with the home secretary to explain the measures we have been taking to ensure that Facebook is a safe and positive platform for people in the UK at this challenging time," it said in a statement. Police in London said that they managed to thwart attacks on the Olympic site and on Oxford Street based information gathered from Twitter and BBM. Communications networks that operate in the UK can be compelled to hand over individuals' personal messages if police are able to show that they relate to criminal behaviour. The rules gathering such queries are outlined in the Regulation of Investigatory Powers Act (RIPA). 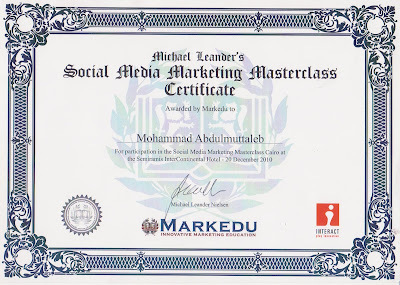 Our social media manager got his certificates for social media marketing and email marketing from attending a training course conducted by the Danish marketing consultant Michael Leander here in Cairo. 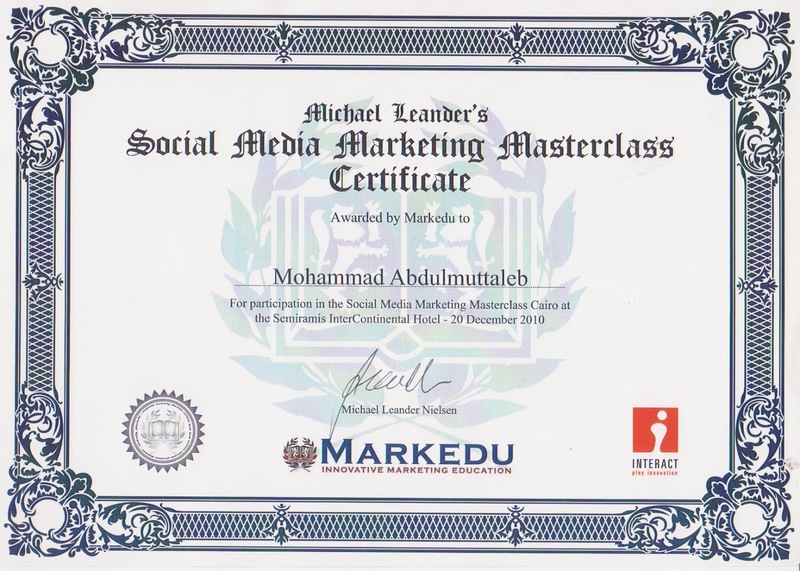 Many local case studies on social media marketing and email marketing were discussed such as Vodafone Egypt case. 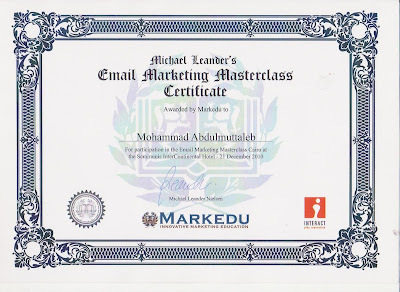 Search engines derive more than 30% of website traffic, so companies need to adjust their search engine optimization to appear on the first page on Google and other search engines. Our company appears on the first page multiple times; the company website as well as our official social media blog.